Domains are often sold by those hosting a website, but you can buy a domain one place and use website services from somewhere else. Sometimes you may prefer to move both into one place. 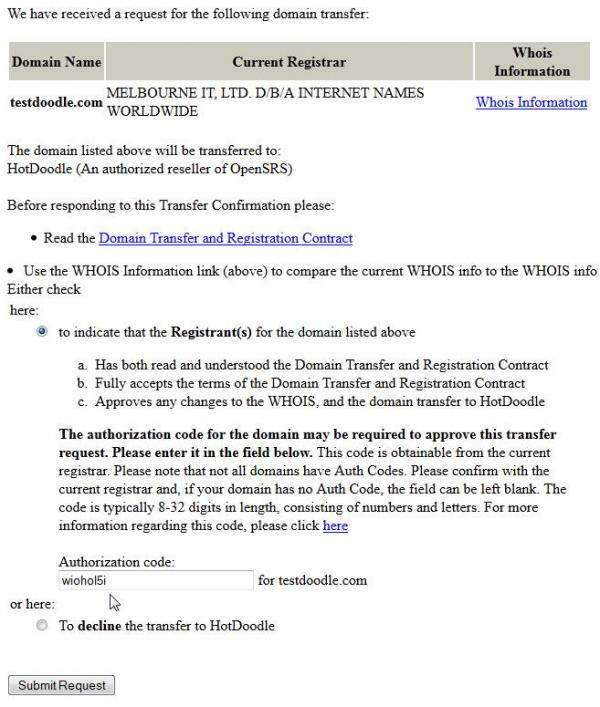 This page discusses how to domain transfer into HotDoodle, and toward the end discusses how to transfer a domain away from HotDoodle. You can gain more control of your domain name and simplfy management by transferring it from its current registrar to our own domain name registrar, OpenSRS. You should start the transfer at least 14 days prior to domain expiration or renewal. As part of the transfer process, domain names will also be renewed for at least 1 year. There is no transfer of emails! The transfer of domain names does not cause a transfer of emails. If, for example, the emails are sitting on email servers managed by GoDaddy then a transfer of the domain might cause new emails to be delivered to email servers managed by HotDoodle but nothing transfers the emails themselves, or the accounts and settings. Transfers take 3 days to propagate: Even after the transfer is fully approved and started, the standards of the internet is that up to three days may pass before all machines notice the change. In the meantime some machines will use the old settings, and some will use the new. To begin the domain name registrar transfer process, send one of the "Requesting a transfer" emails below. The domain name, such as "fremont-gardener.com", gives you the rights to use that name and have it be recognized by the internet. These rights are purchased in 1 year intervals. Variants such as "www.fremont-gardener.com" or "mail.fremont-gardener.com" are part of the same domain. The domain is managed by the domain registrar, a company that handles the special protocols needed to get the internet as a whole to recognize the name. The domain registrar created the WHOIS entry for the domain, which is a publicly searchable listing of the domain, its name servers, and who owns and manages the domain. The registrar offers management screens that allow setting of the WHOIS and nameserver information. The Domain Name Servers (DNS):These are services that tell what domain traffic goes where. The may say, for example, that "www." traffic goes to the machine at address 207.57.83.157 while emails sent to the domain go to a machine at address 64.18.0.253. The domain name servers are often on machines offered by the domain registrar, but they do not have to be there. Whomever offers domain name services will have screens where you can define what traffic goes where. Understanding and configuring DNS records is a real pain, and many services, such as HotDoodle, will automatically configure domain name servers they manage to be properly configured for their services. The various services such as one or more websites, emails servers, and FTP servers. A transfer takes a domain name from one registrar to another. By itself this causes no disruption, but in the case of bundles the domain name servers and sometimes even the individual services may also be changing and these can cause disruption. Domain transfers cost extend the domain expiration by one year and cost the same as buying a new domain name for one year. For example, a domain that expires on 12/14/2015 will expire on 12/14/2016 after being transferred. 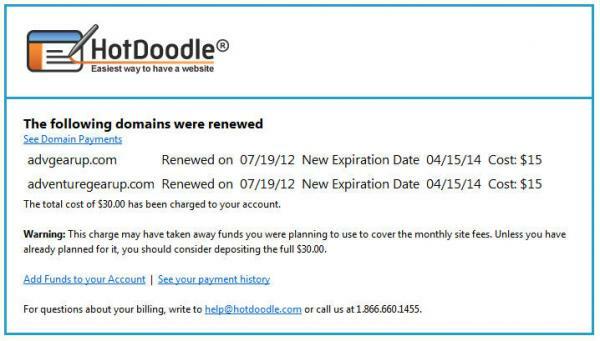 When it is time to renew a HotDoodle domain, it will be renewed approximately 30 days in advance for our then standard domain price (currently $15/year). The price for renewing transferred domains will be the same as the price for extending domains originally bought from HotDoodle. The most common reason for transfer failure is inaction on the side of the customer of the losing registrar. Examples are that the authencation code is wrong or expired, they didn't think it was important to respond to the confirmation emails, the login information for the domain registrar is wrong, etc. We understand that transfers are a pain and we are glad to help our customers, but our customers also have to help themselves. If the transfer fails because the email was not responded to in a timely manner or for some other reason not on our side we may charge $15 per attempt. Some of the less friendly vendors will not allow you to adjust your domain name or change its nameservers once they receive a domain transfer. Sometimes they spin it as protections you but in reality it seems that they just want to make things difficult for you because you are leaving them. You need to plan for this, and celibrating when you escape their grasp is reasonable. 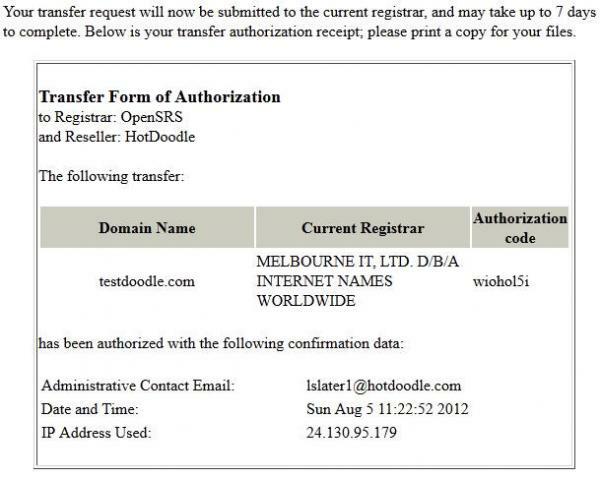 To request a transfer chose one of the options on the side and send it as an email to domains@hotdoodle.com. You have two choices. You can keep your current registrar information private and do all of the "other" side of the process yourself, or you can send to HotDoodle the login information to the current domain registrar and we will do as much of for you as possible. We will not, however, contact their customer support or wait in phone queues. If you are unsure of your domain information, you may lookup the WHOIS and other information here. Once the domain transfer is initiated there is a series of emails and forms. The pictures below illustrate a typical transfer. 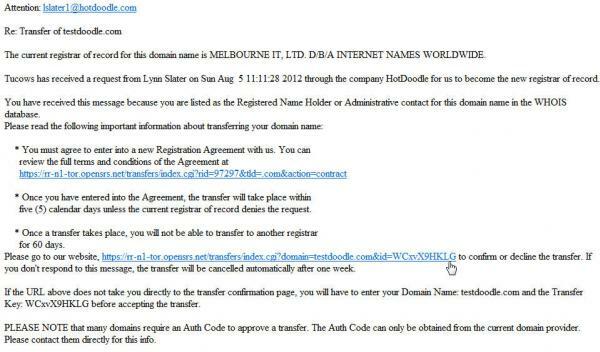 Above is the email sent to the domains administrator of record, as defined by that domain's WHOIS record. This email must be received. Some domain sellers "protect" their customers by discarding all such emails claiming that they thought they were spam. 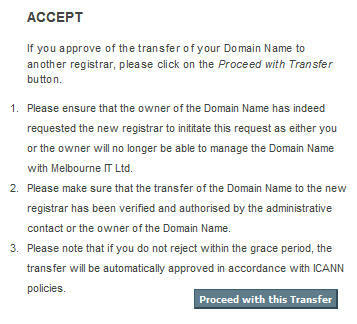 This MUST happen, there is no other way to do the transfer, per ICANN standards. If you can't read this email, log into the seller of the domain and unset all domain privacy and protections, and change the WHOIS admin contact email to one that you can read. A form like the one above opens when the email link is clicked. Here you enter the domain's authorization code. The above confirmation is shown after entering the proper authorization code. Above is an example of an email that might be sent by the domain seller that is losing the domain. Note that sometimes they do nothing and tell you that you should have logged into their system for updates. Sometimes the email has a link that will let the transfer happen right away. Sometimes you can approve a quicker transfer by logging in (see http://www.lodesys.com/blog/2009/godaddy.php for an example based on GoDaddy). In some cases they wait and then decline the transfer, forcing you to call their customer service an then start the whole process over again. Above is an example of a form you can sometimes find to speed up the transfer. You may get to it by a link from emails or by logging in to the control screens of the losing domain seller, but some domain sellers do not have one, or make it vey hard to find. We will bill you $15 per domain at the start of the transfer attempt. If the transfer fails because the email was not responded to in a timely manner or for some other reason not on our side we may charge $15 per re-attempt. We resell domains from OpenSRS, the largest whole seller of domains. We let and encourage you to go to OpenSRS screens for domain management, trusting that their track record as the largest wholeseller proves that their screens are acceptable. We never apply charges for transfer out, and we never disapprove transfers. Domain transfers are always initiated by the receiving domain. As the screens above show, transfers are a real pain and it is not surprizing that most domain name sellers simply refuse to handle transfers. You may have to explore deeply in their screens to find out how to get started. and then click "Show Registration Management" to see the OpenSRS login instructions. 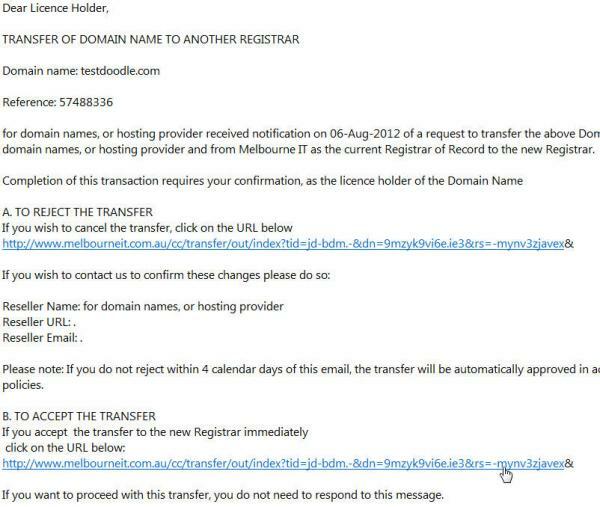 Transfering a domain does not discontinue HotDoodle services or change any scheduled payments. You might, for example, have transferred so another vender can automatically configure their complex email settings.